The day after a raging house party, we didn’t want to do anything but decompress, and that essentially means movie time. Since there were seven of us, we picked seven movies and had each person eliminate one, ending with this movie that none of us had ever heard of. Strangely and by total coincidence, four out of the seven movies starred Robert Redford. After our selection process, we watched Downhill Racer, a 1969 film starring Robert Redford and featuring Gene Hackman. Directed by Michael Ritchie, whose most famous film might be The Golden Child (starring Eddie Murphy), Downhill Racer is about an Olympic downhill skier who fights his way to the top. This movie is basically an extended analogy for the American dream. The protagonist, David Chappellet, begins as a competitive skier who cares about winning more than anything else. His coach, played by Gene Hackman, tells him to play his position (rank #79 on his team), but Chappellet refuses to accept that he isn’t the best. Through hard work and the emotional rejection of girlfriends and parents, he grinds his way to the top position – but in the end, is it worth it? This movie has something to say about success and the path that you take to get there. But since the protagonist is so emotionally distant and difficult to decipher, you wonder how much there is to actually figure out at all. It’s like Drive with Ryan Gosling but without fleeting glimpses of the protagonist’s vulnerabilities. And it’s not nearly as stylish as Drive. With all of that said, the narrative is coherent and features a lot of the twists and turns that you’d expect a modern movie of this type to have. The whole thing just feels very stark, with little dialogue and a minimal soundtrack. 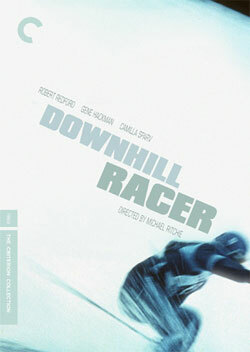 Perhaps since Downhill Racer was made in 1979, it looks extremely old, but it is stylish. There were a few things extremely unusual about this film in particular. The first thing is that the full credits played at the beginning of the film and not the end. Five minutes in, we’re watching the entire film’s credits (which were actually pretty slick, with freeze-frame skiing shots framing the credits). When the Technicolor logo appeared I knew that they were the actual full credits, because that’s what you see at the every end of the actual credits for every movie. The second bizarre thing was the ending of the movie. Spoiler alert: the protagonist in Downhill Racer becomes an Olympic champion at the end. This shouldn’t come as a surprise, really, but what is strange as that as soon as he wins the gold medal, he smiles and the screen turns black. Movie over. No music, no credits, nothing. This movie is incredibly stark and abrupt. After Downhill Racer concluded, we decided not to sleep yet and watched American Beauty. The contrast between the two was staggering. American Beauty features relatable characters, familiar settings, and a lush soundtrack. It just felt so much more coherent. I often prefer older movies because many of them were produced before the mold of modern film convention had been set. But some of them just age better than others.